Bruce Lim (IPOPI Board Member and Treasurer) actively participated in the 5th APEC Blood Safety Policy Forum held in Taipei, Taiwan, on 10-11 December 2018 which focused on “Raising and Converging Standards through Centres of Excellence” with a presentation providing the patient perspective in the session “re-examining self-sufficiency in APEC economies – the patient perspective”. Mr Lim highlighted, among other points, the importance of ensuring national blood policies or future amendments to existing national blood policy should have the patient needs as the primary focus. IPOPI has been a regular participant in the APEC Blood Policy Forum meetings and has participated in the preparation of the APEC recommendations on enhancing access to safe therapies for persons living with immunodeficiencies and bleeding disorders and the APEC recommendations on implementation of good manufacturing practices for blood and blood products. Access to a safe and sufficient supply of blood and related products and services, including blood transfusion, is a critical element of any health system. APEC has outlined a number of specific goals as part of the APEC Blood Supply Chain 2020 Roadmap to establish quality systems and implement good manufacturing practices to optimize the safety of the blood supply. 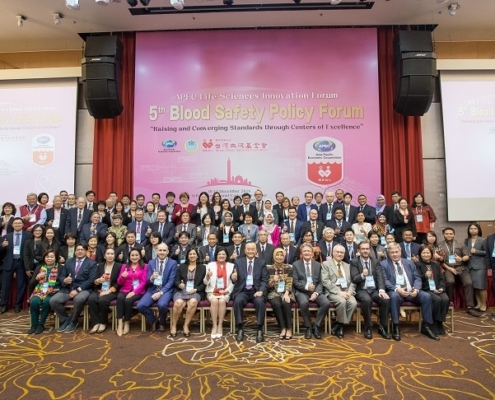 The Policy Forum helped identify ways in which centres of excellence can help accelerate GMP certification in APEC economies and open up new opportunities to converge the quality and safety standards for blood products across the Asia-Pacific region. IPOPI remains committed to partnering with APEC to provide the patient perspectives in these important policy discussions who have the potential to significantly improve access to life-saving plasma derived medicinal products for patients living in the region.